A major area in PAW is the coordination of the adoption shows. This pertains to regular shows at the pet stores, not to special events, festivals, or PAW participation in multi-group shows (although many items could apply to all). The following sections, and tasks within, can be split among any number of people. At a minimum, the committee consists of the show coordinator (chair) and the cat and dog coordinators. Other members could be the President or designate, the volunteer coordinator, the cat and dog transport coordinators. What makes a good store location? It’s the space, the management, Sat. versus Sun., the amount of public coming through, and the quality of the applications. This and other factors are subjective since opinions may vary among volunteers. The Board and coordinators may only hear negative feedback since people rarely bother to communicate positive experiences. Also, the number of cat and dog applications is recorded after each show. The percent that get adopted is an indication of how effective the store is. However, it is difficult to gather these data since many apps are electronic or mailed and it’s hard to connect these with a particular show. Usually, the adoption shows follow a regular cycle each month. That is, PAW is at the same store on the first Sat. of the month, the first Sun., the second Sat., and so on. Based on input from the dog and cat coordinators, some shows are both cats and dogs, cats only, or dogs only. A month with five Saturdays or five Sundays would have non-regular shows on those days, and/or may have some other unusual scheduling. New locations or other experiments may be inserted in a given month to replace a regular location. Note: any PAW decisions regarding show locations must be approved by store directors or managers. Call the store to discuss the proposed change before revising the schedule. Bringing everything needed for the show and setting up the table. Getting the area ready for the cats and dogs prior to their arrival. Taking attendance when the volunteers arrive and immediately reporting any volunteer issues/no-shows to the Show Coordinator. Providing Name Badges to all volunteers. Assisting with answering questions from the public and helping the volunteers if any issues arise during the show. paper clips, scissors, tape, etc. On a weekly basis, the show kit should be restocked for the next show. This usually means table handouts, forms, and show supplies. Make copies of forms and handouts for the table. Arrival time varies by store, by manager, by whether the setup person has help, by whether the setup person also brings a dog. Discuss where that day’s space is for cats and for dogs. Find out any rules or preferences, such as being in the center of an aisle or along one side. Lay out the various handouts, adoption applications, etc. for the public along with pens, donation box, business cards, hand sanitizer, Dog/Cat book listing all our current dogs/cats, dog treats, etc. Place the outdoor and indoor signs, that announce the show, in appropriate locations. You may have to move a store rack or display to create space in the cat and dog areas. Fill the water bowls and place in the dog area. The store may have some extra folding chairs, usually in the employee break room. The public may arrive as early as 11:00. There may be phone calls. As the only PAW person on site, answer the calls and deal with the public. As volunteers arrive, direct them to the cat or dog areas and inform them of any rules given by the manager. Take attendance of the dogs and volunteers as they arrive. As needed, perform table staff and floater duties. Help sign in the dogs. Keep the table straight as the public and volunteers tend to place clip boards and other materials anywhere. Refill water bowls. Find mentors for new volunteers. Enforce management rules about space, blocking certain shelves, whatever. Replace table items as they run out. Give any adoption or foster applications that are turned in to the Dog Coordinator. At the end of the show, write down the number of cat and dog applications for the manager. It’s usually good to include the date, the name of the group, and the date of the next show. Put away the merchandise and volunteer items first since they are infringing on store shelves or whatever. While packing the table materials, make notes indicating which forms and handouts need copies for the next show. Don’t forget the water bowls, plus the indoor and outdoor signs. 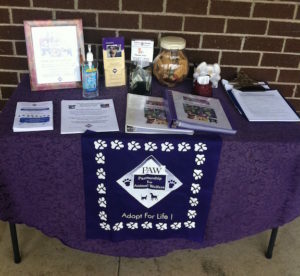 PAW has a special relationship with the stores because we leave our areas in the same condition in which we found them. Search the shelves and floor where our volunteers were to pick up trash plus any supplies that should have been returned to the volunteer station. Return chairs to the employee break room. Grab a broom and sweep the area for dog hair, etc. Move any displays back where you found them. Write up the Thank-You for all the volunteers who attended the show, along with the dogs in attendance, to be mentioned in the next PAW This Week (PTW). Email it to the Secretary or designate.